Happy Fourth, y'all! I hope you are all having a fun holiday weekend! Fourth of July is one of my favorite holidays, even though it's usually pretty casual in my family. This year, we participated in our neighborhood parade, and later on went to an FC Dallas game, complete with fireworks after. 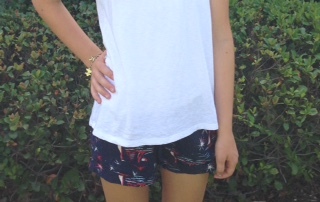 I'm kind of in love with these shorts that I scored for $12 at Old Navy! They're really similar to the Lilly ones a couple years back, except so much cheaper. I know, I know, Old Navy got sued for all this and I should be on Lilly's side, but I'm sorry. I love these shorts and I don't care. I love how they add a fun pattern against my white top and shoes. My mom snapped this right as my sister took a huge bite of her Bomb Pop... but whatever. It was still cute and hey, I live for those candid moments. A lot of our neighbors drove their vintage cars in the parade. My favorite was this bright blue one - how cool would it be to drive around in this?! 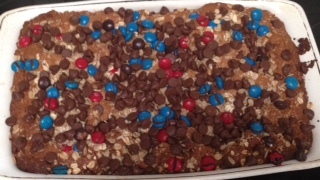 These cookie bars were hard to make and they didn't look the prettiest, but they tasted SO GOOD. FC Dallas won 3-0 and they played really well! It was so fun getting to see them play. After the game there was a really cool fireworks display complete with music! Hi - sorry about that! I must have clicked on the wrong link party by mistake. Hope you had a good holiday weekend.